The Westland Sea King is a license built variant of the Sikorsky S-61 Sea King design. It differs from the Sikorsky in having Rolls Royce Gnome engines, a 6 blade tail rotor and British avionics. 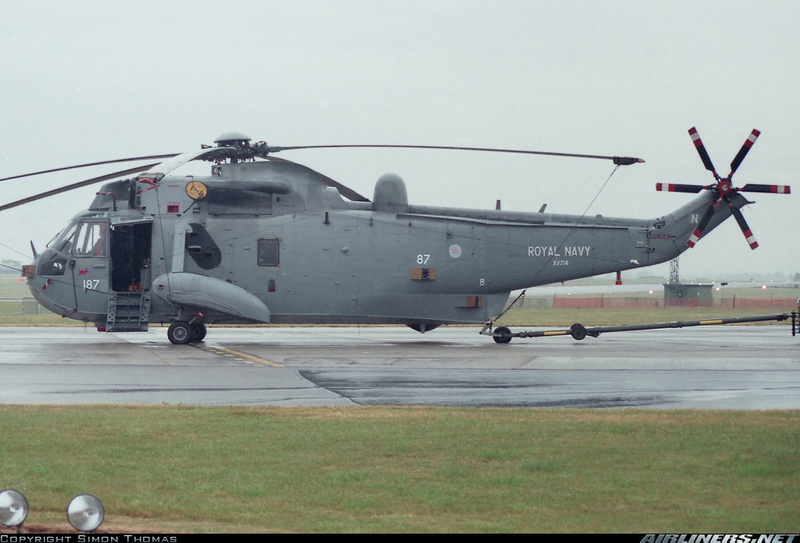 The Sea King first entered service with the Royal Navy in 1970. In 1982, the British Commanders realised that they needed an AEW asset to cover the Falklands Task Force. Given the limited room aboard the RN's carriers, a helicopter-based platform was the only choice. 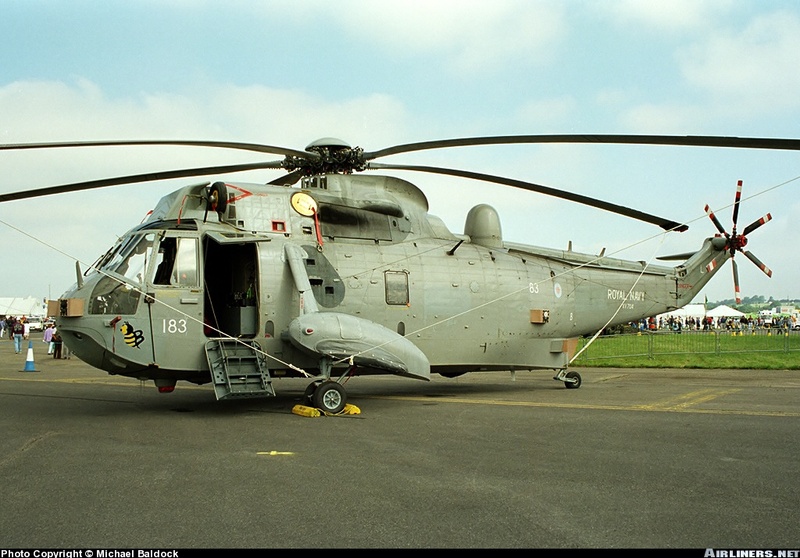 Westland fitted a Thorn-EMI Searchwater radar to two Sea King airframes in record time and rushed the completed aircraft out to the fleet just in time to miss the hostilities. Since then, the AEW Sea Kings have given valuable coverage to the Royal Navy's operations. The AEW2 fleet were converted to ASaC7 standard starting in 2001 with new radar, command and control equipment fitted. The kit comes in a large sturdy box with a tightly fitting lid. 7 sprues rattle around inside; the box could stand to be a fair bit smaller and still have room to hold everything. The sprues are sorted into bags by size, with the clear parts in their own bag, which should do a good job of protecting them from damage. The mouldings are sharp and the fine details nicely crisp. The instructions are well laid out and easy to understand, but inexplicably do not show any painting information for any of the interior parts or assemblies. Painting instructions are given for only the first of the marking options; all other profiles assume that the modeller has read the first one. The main fuselage colour is called out in a tiny box pointing at the underside of the nose. At first glance it looks as though it's a detail colour callout. Since the colours for each option are identical it's not a huge problem, but it is an annoyance. The rotor colour is not specified, but since it has the same tonal value as the black on the radome, I am forced to assume that it too is black. Reference photos show that the black on the main rotors and fuselage sides is very weathered and faded. Inadequate painting instructions are a feature of kits from the 1970s, not from the second decade of the 21st Century. These instructions are not up to the standard set by Dragon kits from the 1990s. The fuselage is made up of two sides and a bottom plate. There is a full length cabin floor with a nicely detailed cockpit and entryway section, but there is no representation of the radar equipment pallets nor the operators' station. The only detailing in the rest of the cabin is two sets of seats left over from the HC.4 version, and these look awfully small to be 1/72. If you want to leave the sliding door open, you will have to scratchbuild everything from the forward bulkhead aft. 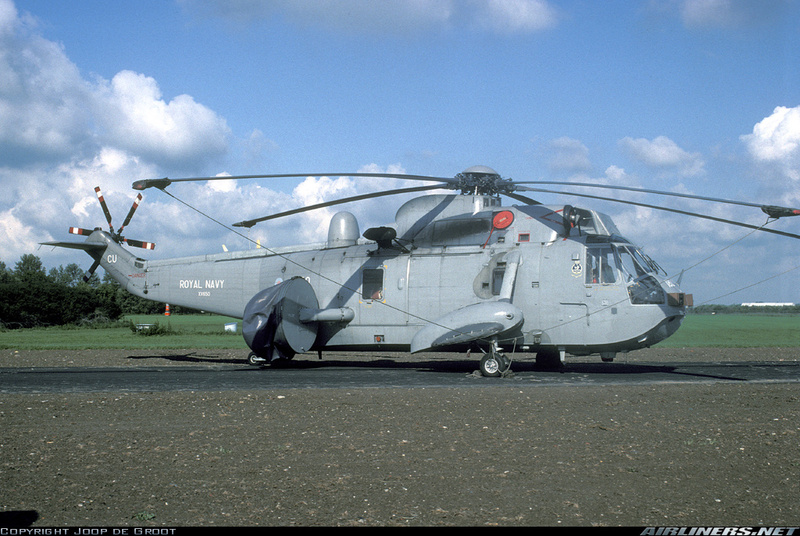 Finding references showing what the AEW Sea King's internals look like is a trifle difficult. The radar support rod mounts directly to the door rather than a solid mounting with the door cut out around it as on the real aircraft. Leaving the door open would entail quite a bit of scratchbuilding. Photos show that the boarding step shown in step 5 is not fitted to the AEW.2. Leave it off. The cockpit has adequate detail right from the box, but the copilot's collective lever is shown as mounting on the right side of the seat rather than the left as is traditional with helicopters. A new mounting hole should be drilled to the left of the seat and the existing one filled in. The Searchwater radar dome is moulded inflated. Since the dome is only inflated in flight, this means that it must be replaced if the helicopter is modelled at rest. A replacement deflated bag may be made from epoxy putty or sourced from the aftermarket. The very prominent strengthening strake that runs the length of the port side of the rear fuselage and tailboom is missing. The many exterior antennae, probes and pipes which clutter up the Sea King are separate pieces, some of which are quite delicate. Care must be taken when removing these from the sprue. The engine intake filter fairing is the earlier type which limits the marking options to earlier than 1999. The radar warning receiver boxes were not fitted to the aircraft which were deployed to the Falklands, which makes me wonder why this particular boxing was chosen to commemorate the anniversary. They are separate and may be left off, meaning that a Falklands marking scheme could have been offered. I think Dragon missed the boat on that one. Dragon provides two sets of rotors, each with a moulded-in curve. One set is moulded as though the aircraft were in flight and the other as though it were at rest with the rotors drooping. There is also an option for the rotors to be built folded, which will make for an interesting display option. The end of the tail boom is moulded separately, but there is no option to show it folded. The internal details would have to be scratchbuilt if that option were chosen. The tail rotor is one piece with a small separate control linkage. The landing gear is adequate, although the support webs on the sides of the main struts are moulded solid. There is a pattern of large and small lightening holes which is quite distinctive of the Sea King. These holes should be drilled, or the webs replaced by plastic card or etch for a more scale appearance. XV714 with what appears to be a red Aardvark under the cockpit side windows. 849 Squadron is organised as A and B Flights, which are usually deployed separately. It could be that the Aardvark and Bumblebee markings are Flight designators but this is not indicated on the instructions. None of the painting options are given dates. The aircraft were upgraded with new engine intake particle filters beginning in 1999, so these schemes have to date from before then. XV650 and XV704 were the two prototypes which were rushed into service in 1982. Sadly, these two aircraft were lost with all hands in a mid-air collision in 2003 while conducting night flying operations in the Persian Gulf. This is a nice kit, let down slightly by inadequate instructions and missing details. Dragon really missed the opportunity to capitalise on the anniversary of the Falklands War by not including a marking option for the aircraft involved. XV650 in the kit scheme, 1990. XV714 in the kit scheme on static display in 1996. XV704 in the kit scheme on display in 1997. Lows: The main cabin is completely empty. The AEW fit is only external. Missing fuselage strake and some incorrect details. No Falklands markings in the kit. Verdict: While not perfect, this is a nice model of the Westland Sea King. It could be converted to an ASW variant should Dragon decide not to bring that option out.